Wellness organizations in eastern North Carolina are trying to break the stigmas associated with mental disorders and substance abuse. 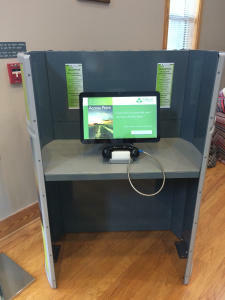 They’ve launched a pilot program with two screening kiosks in Hyde and Dare counties to help people identify behavioral issues and connect with resources. Sarah Finch has more on these interactive booths and a new computer program that may know you better than you know yourself. Taking care of your health means paying attention to your body AND your mind. Yet in today’s society, behavioral issues are considered a touchy subject. Mental health disorders ranging from depression to PTSD are common both nationally and locally, but they’re not always addressed and treated in a timely manner. For Eastern North Carolina this is especially true. Trillium Health Resources Clinical Operations Vice President Cindy Ehlers says it’s because ENC encompasses so many rural areas. Trillium Health Resources doesn’t provide direct care, rather, they connect individuals and families to resources in their own communities. As a local governmental agency, Trillium Health Resources manages mental health, substance use and disability services throughout 24 eastern North Carolina counties. Trillium’s response to the stigma of mental health disorders, was to install two wellness booths at the Hyde County Government Center and the Dare County Department of Public Health building. They created a computer program that screens people by asking detailed questions and then referring them to local treatment centers. Trillium Health Resources Project Coordinator Bobbie Lowe likens the technology to drug store diagnostic machines. The wheelchair accessible kiosk is like a small cubical with a touch screen computer plus both English and Spanish language options. The first step identifies how the subject has been thinking or behaving. The Access Point program then asks questions about how you’re feeling. After ten to fifteen minutes, a comprehensive report about your moods and behaviors is displayed on screen. Vice President Cindy Ehlers says these screenings are educational, not diagnostic. The Access Point program also connects users to resources, including treatment recommendations, referrals and educational materials. The provider database is organized by county, with a comprehensive list of all the mental health professionals in that area, so that people can choose to follow-up with a local specialist. Project Coordinator Bobbie Lowe says they have also installed a phone in the screening kiosk that rings straight to the 24-hour Trillium help-line. Setting up each of the kiosk stations with their privacy booths and the computer software cost about five thousand dollars. The money for the first two kiosks came from a grant but Trillium plans to launch four more screening kiosks in January with their own funds. Vice President Cindy Ehlers says they are currently in discussions with other eastern NC counties to determine the most appropriate locations. Since unveiling the mental health kiosks last month in Hyde and Dare counties, more than 141 screenings have been completed. Hyde County Public Health Department Director David Howard hopes the kiosks will push people to get preventive treatment early. The Access Point Program offers self-conducted screenings for Depression, Bipolar Disorder, Post-Traumatic Stress, Generalized Anxiety, Eating Disorders and Alcohol Abuse. The kiosks can move to other areas within the county on a rotating basis.